Thelma (Eili Harboe) is a young woman who’s led an incredibly sheltered life. Her strongly religious parents have completely controlled her existence, but now she’s getting her first taste of freedom by going away to university. As she settles into college life – which still includes the need to contact her parents everyday so they can keep an eye on her – she starts to have feelings for one of her female friends. While she initially tries to deny what’s happening, it begins to unlock deeply suppressed psychokinetic powers which she may not be able to control. They are powers which could be extremely dangerous if fully unleashed. 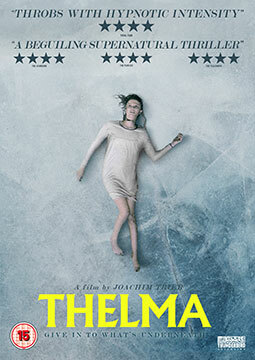 Thelma is a movie that starts as it means to go on, with a father and his daughter hunting in the woods. All seems fine until the dad points the gun at his child. From there the movie builds an eerie, unsettled feel, where what should be simple and natural becomes dangerous and full of tension. It would be easy to dismiss it as a Carrie rip-off, but it’s more than that. It is a modern examination of suppression and denial, looking at how things such as religion can be used to avoid dealing with a problem, and ultimately make things worse. It presents a complex morality, designed to get the viewer thinking. A few years ago, Thelma’s emerging sexuality would probably have been presented salaciously and as just another ‘symptom’ of her strangeness. However, Trier carefully presents her as an innocent – despite what we learn about her. Her sexual awakening is shown as something beautiful that is threatened with destruction not by the supernatural powers inside her, but by the control and repression that has been thrust upon her which means she now has no idea what she’s dealing with. It is at times unnerving and often intriguing, using some beautiful imagery to something something both familiar and otherworldly. That intimacy between the mundane and the strange also allows it to build empathy for its central character, played sublimely by Eili Harboe. It feels like an extremely timely movie – an allegory for sexuality, female power and the generational divide. At times it may have uncomfortable things to say about those things, but it’s a tantalising and sometimes darkly humorous movie that lingers in the brain. There are also echoes of the effect of ‘gay cure’ therapies and the devastation they can wreak, which goes far beyond the person ‘cured’. Overall Verdict: A haunting, morally complex and sometimes tense movie that takes modern issues to the edge with empathy and supernatural eeriness.